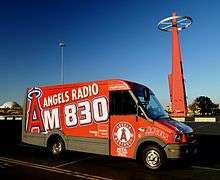 The Angels Radio Network is a network of 10 radio stations that air Major League Baseball games of the Los Angeles Angels of Anaheim. As of April 2010, 9 stations broadcast games in English, while another broadcasts them in Spanish. The English announcers are Terry Smith on play-by-play and Mark Langston with color commentary. KLAA's utility van "Angels Radio Reach"
A separate network airs games in Spanish. ↑ "Angels Radio Network". Los Angeles Angels. Retrieved April 24, 2010.